Our interns at AFJ are getting excited to hear Kevin Jennings speak at our free annual summer lunch next Tuesday, August 3, at 12:30pm. Mr. Jennings is currently serving as the Assistant Deputy Secretary for the Department of Education, and was the founder of the Gay, Lesbian, and Straight Education Network (GLSEN) which brings together LGBT and straight teachers, parents, students, and community members to help fight the anti-LGBT bias in school. GLSEN has helped make safe schools a national issue. It is going to be such an opportunity to hear from a great activist who has made a tangible impact on LGBT rights. Interns and Summer Associates are welcome to join us August 3rd for this event. Attendance is free, but RSVP is required. A new study by Pediatrics, the official journal of the American Academy of Pediatrics, is raising new questions about the safety of medical devices in children. Congress should respond by passing legislation restoring the right to hold medical device manufacturers accountable in state court when they manufacture defective products. Pediatrics found that over 70,000 children and teens go to emergency rooms annually for injuries and complications from medical devices. As a result of the 2008 Supreme Court decision in Riegel v. Medtronic, certain medical device manufacturers now have total immunity from liability. These manufacturers now have no financial incentive to either produce safe products, or recall unsafe devices, leaving thousands of Americans at risk. The Pediatrics study reported that the percentage of injuries attributable these types of devices is small, but the injuries tend to be the most serious and expensive to treat. They include many catheters, pacemakers and artificial joints. The Medical Device Safety Act (“MDSA”), is a pending bipartisan bill, designed to reverse the devastating impact of the Riegel decision. The legislation is simple – the bill in its entirety runs less than two pages in length. Passage of the MDSA will restore the long-standing right of injured consumers to hold negligent medical device manufacturers accountable when their products cause injury and death. Learn more about the MDSA, and the patients it would help, by watching AFJ’s short documentary film, Hit and Run. Medical device companies are lobbying hard to stop the MDSA, and have succeeded in stalling any committee action. With Pediatrics documenting so many potentially serious injuries of implantable devices, it’s imperative that Congress restore the rights to the young victims’ families and pass the MDSA without further unwarranted delay. and take action at www.thecorporatecourt.com. And, contesting to Justice Roberts’ self-depiction as an uninterested umpire, Senator Whitehouse said, “precedents, whether of old or recent vintage, have been discarded at a startling rate. Statutes passed by Congress have been tossed aside with little hesitation, and constitutional questions of enormous import have been taken up hastily and needlessly…. There is an unmistakable pattern. 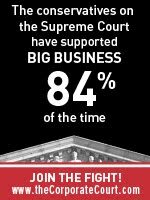 For all the talk of umpires and balls and strikes at the Supreme Court, the strike zone for corporations gets better every day. Many Democratic Senators focused their questions for Kagan on a number of Roberts Court decisions that highlight the intense corporate bias of the current Court, including Citizens United v. FEC, Exxon v. Baker, Ledbetter v. Goodyear Tire & Rubber Co., Rent-A-Center v. Jackson, Leegin Creative Leather Products, Inc. v. PSKS, Inc., Rapanos v. United States, and Gross v. FBL Services. Nearly all of the Democratic Senators on the Committee spoke out against the landmark Citizens United decision, which opened the floodgates to corporate spending in elections. Senator Whitehouse made a similar critique, noting that the Court had to engage in inappropriate fact-finding rather than limiting its consideration to the record before it in order to reach the decision it did in Citizens United. With oil gushing into the Gulf of Mexico while the confirmation hearing took place, many senators addressed the recent Supreme Court decision of Exxon v. Baker, which reduced the plaintiffs’ original award by 90% and promulgated a new rule that punitive damages cannot exceed compensatory damages in maritime cases. Senator Kaufman warned that the Court’s decision to slice the plaintiffs’ damages by two billion dollars could have the effect of lessening incentives for companies like Exxon or BP to take appropriate safety precautions to avoid potential spills. While Congress has rectified the injustice created by the Roberts’ Court decision in Ledbetter by passing the Lily Ledbetter Fair Pay Act, numerous senators expressed frustration over the decision and the Court’s seeming inability to foresee the real-world consequences of the decision. Senator Cardin railed that the Court used the case to articulate a new test that was “incredible to believe” and which made it “impossible” to discover pay discrimination and bring a timely claim. Senators Whitehouse and Franken discussed the Rent-A-Center v. Jackson case, handed down the week before the Kagan hearing. The case involved a challenge to the enforceability of a mandatory arbitration agreement employees were required to sign as a condition of employment. Leegin Creative Leather Prods, Inc. v. PSKS, Inc. Many senators expressed concern over the weakened environmental protections in effect after the Rapanos case, which restricted the federal government’s jurisdiction over many of the nation’s waterways under the Clean Water Act. · Senator Cardin criticized the case as a “step backwards” for the environment because of the reduced protection for wetlands under the Clean Water Act. Many senators remarked on Gross v. FBL Services, which made it considerably more difficult for victims of age discrimination to prove their case by creating a new rule that in a mixed-motive age discrimination case, the plaintiff must prove that discrimination was the sole reason for the termination.